Considering the amount of confidential information you receive and store at your home, it is necessary to have a method for its proper disposal. Neglecting to keep your private data protected could result in detrimental consequences for your identity—which in turn could affect your future. So, when it comes to finding a shredding service for all that paperwork building up in your home office, what is the best option? Well, the answer depends on a couple of different factors. Do you have time to gather up all of your materials? Would you feel more comfortable being able to see your documents destroyed right before your eyes? If you have more than a few boxes of paperwork at your home, a mobile shredding service might be able to help you! Mobile shredding makes the destruction process even e asier, and also gives you more peace of mind because you get to see everything being shredded right in front of you. 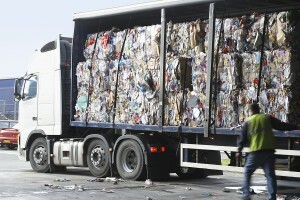 Why Should You Choose Mobile Shredding? Some people think that having someone come to your home is going to be more expensive than going to a drop off location, but that isn’t always the case. Depending on how much paperwork you need to have shredded, you may actually save money by having someone come out to you. When it comes to a drop off location, you’re looking at a charge typically right around a dollar per pound. One copy-paper size box that is full of paperwork is about 30 pounds. So, if you have three boxes of paper that you need to have shredded, you’re already looking at around $90.00. With a mobile shredding service, there’s typically a flat fee. If you have up to 10 boxes (about 300 pounds), the flat fee is normally about $100.00. All mobile contractors are different, and prices may vary, but if you have a few boxes up to 10, it’s usually cheaper to have someone come to you! Mobile shredding contractors allow you to spend less time worrying about your shredding service, and more time focusing on other important matters. Rather than spending hours gathering up all of your materials, the contractor will handle all of the work for you. Furthermore, onsite shredding services eliminate the time spent searching for a nearby drop off facility, as well as the need to transport all of your materials to a different location. Making sure that your private information remains confidential is vital to your destruction process. Not only can mobile destruction services save you time and money, but you get to see your materials go through the entire destruction process. Your mobile shredding contractor is required to comply with all state and federal data destruction laws and regulations, and provides you with a Certificate of Destruction stating the details of your shredding service for every project completed. This document serves as proof that your materials were properly destroyed. Receive a Free Quote on Mobile Shredding Services in Your Area Today! Shredding your paperwork is important—why not make the whole process easier on yourself? To find a mobile shredding service near you, fill out the form to the right, or give us a call at (800) 747-3365. Within minutes of receiving your request, you will receive quotes from experts in your area that will help you select the service that works best for your project.